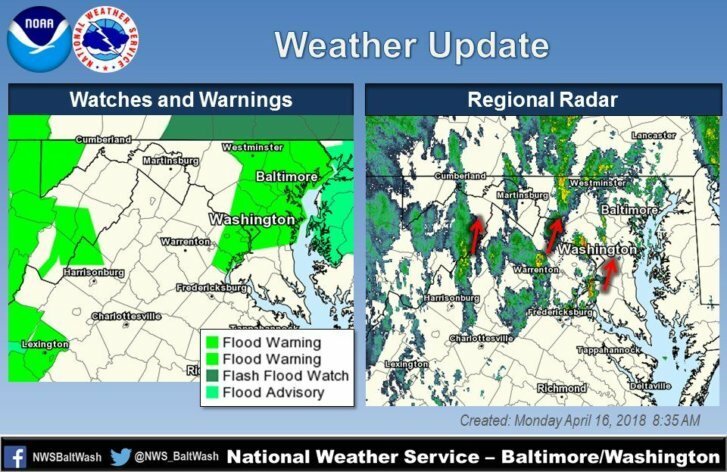 Flood watches and warnings updated by the National Weather Service Baltimore/Washington. WASHINGTON — A light rain continues to fall across the D.C. region Monday afternoon, and flood warnings are being lifted. But damage and traffic problems remain in some parts of the area after heavy rains hit the region from Sunday night into Monday morning. The deluge led to marooned motorists, traffic and transport woes and a busy morning for first responders. Unofficial numbers from the National Weather Service found that between 1.5 and 3 inches of rain fell over various parts of the region, as rain continues in parts of the area. Flash flood warnings were issued early Monday for much of the area; many of them had been lifted as the morning went on. Montgomery County Fire and Rescue tweeted it was on the scene at the Radisson Hotel in Rockville. The hotel was evacuated because of flooding. A number of the water problems were related to runoff and drainage problems, according to WTOP’s Dave Dildine. In Maryland, Beach Drive is still closed between Connecticut Avenue and Cedar Lane. There were painful delays on northbound I-95 and I-395 Monday morning, as more than 20 miles of HOV lanes were flooded near Duke Street before crews managed to get flooding under control. Interstate 66 was also closed in Arlington due to high water before reopening. The Fairfax County police had been keeping track of road closures through the morning. MARC and VRE trains reported suspensions and delays of trains. For the latest power outages see below. WTOP’s Rick Massimo contributed to this report.